After yet another successful trip to the farmers’ market this morning I decided to make a smoothie using a few things that I purchased. 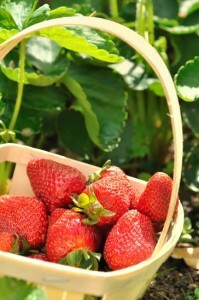 Strawberry season is fast and furious here in Michigan so I make sure to load up on these delicious treats, and put some up in the freezer for future use. Along with strawberries I got a couple bags of salad mix and a bag of kale, all of which made their way into my blender. I’ve written it before and will echo it again, locally grown produce is your best and healthiest option. Even better if it’s organic. Get to know the people who grow your food and the methods they employ. The choice between supporting your local community and a huge corporation is a pretty easy one for me. You can’t always buy local, but at least make an effort. I’m confident you’ll find it rewarding like I do. This is a classic green smoothie with a couple fruits and a green leafy vegetable or two that will supply you with a healthy dose of nutrients. Lately, I’ve been adding a dash of sea salt to most of my smoothies to enhance the taste and provide some extra minerals. Enjoy! Place all of the ingredients into your high speed blender and blend on high for around 30-45 seconds or until the desired consistency is reached. Please leave a comment below if you try this delicious strawberry salad greens smoothie. Happy Blending! You just need to confirm your subscription, Amanda. Excellent – you’re welcome, Lee!